The Fond du Lac Amateur Radio Club conducts exams for amateur radio operators at least quarterly and on-site testing is available for those with limited mobility. Amateur radio exams are conducted by a team of club members who serve as ARRL-accredited volunteer examiners. 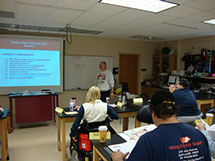 The club also holds weekend training classes for people who want to qualify for the Technician Class License. There is no charge for the class. These classes are typically held twice a year at UW-Fond du Lac. From time-to-time, the club holds training classes for people who want to qualify for the General Class License. NOTE: The club does NOT hold Extra Class Training, but some members will help anyone who needs help qualifying for the Extra Class License. Contact Jack Heil, education@fdlhams.org, to register or for more information. Find out more about Licenses, Training Manuals and Practice Exams.